All Judy and Charlie Swanson want is to farm in Boone County, Iowa with their family. Will Rogers famously said, “The farmer has to be an optimist or he wouldn’t still be a farmer – but today, hard work and optimism aren’t enough to keep the family farm alive. America is losing a way of life. The dominance of mega-farms, global economic instability, and the flight of sons and daughters to “off farm” jobs all work against families like the Swansons. In FIELD WORK: A FAMILY FARM, filmmaker John Helde follows the Swansons over three growing seasons, documenting the personal and financial challenges Charlie and Judy face as their three children leave home to start their own families. This next generation of Swansons – Jeremy, Courtney and Kiley – all speak openly about their hopes, fears and dreams. 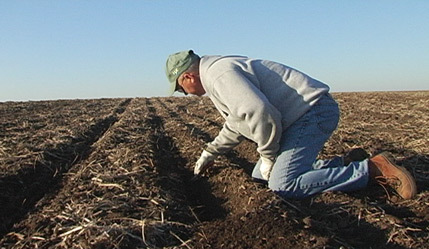 Jeremy, the oldest, purchases his first 80 acres and plants a stake in the ground that few of his generation will ever know. Courtney, who hated farming from childhood, leaves to pursue a degree in counseling. Kiley takes a chance on an experimental high tunnel, opening up a potential new revenue stream for the family. Along the way, we meet a cast of determined and individualistic characters – from hog farmers to local vegetable growers – all bent on making a living from the land. FIELD WORK: A FAMILY FARM weaves sweeping vistas and a haunting Americana Roots soundtrack by Truckstop Souvenir to reveal a part of this country’s lifeblood that is often taken for granted. Through the lens of one family, this poignant and personal documentary explores where the American family farm is headed in the twenty-first century.